Exploring St David’s Cathedral and city. 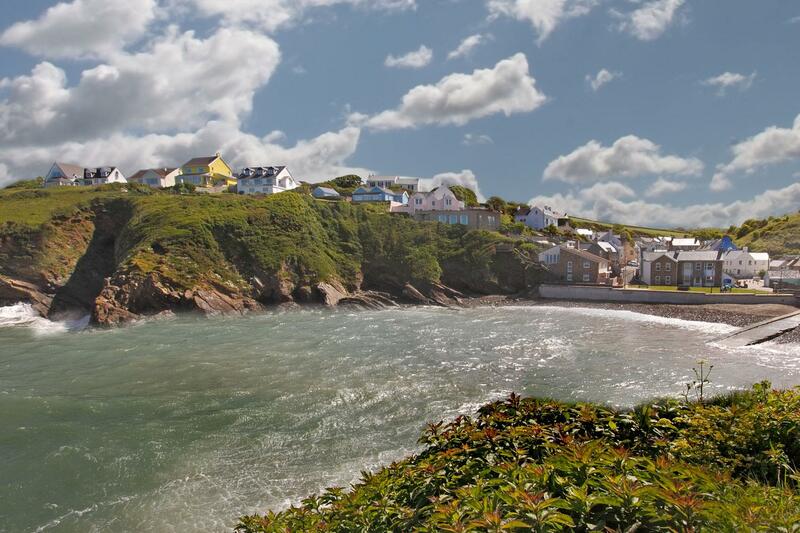 During a week of first class walking you will wander through flower- filled fields, enjoy warm hospitality in quaint fishing villages, stride out along high Atlantic cliffs and visit historic St David’s Cathedral. Bird watchers and nature lovers will be thrilled by Skomer Island, the largest colony of seabirds in southern Britain is home to puffins, kittwakes, fulmars and 100,000 pairs of shearwaters. 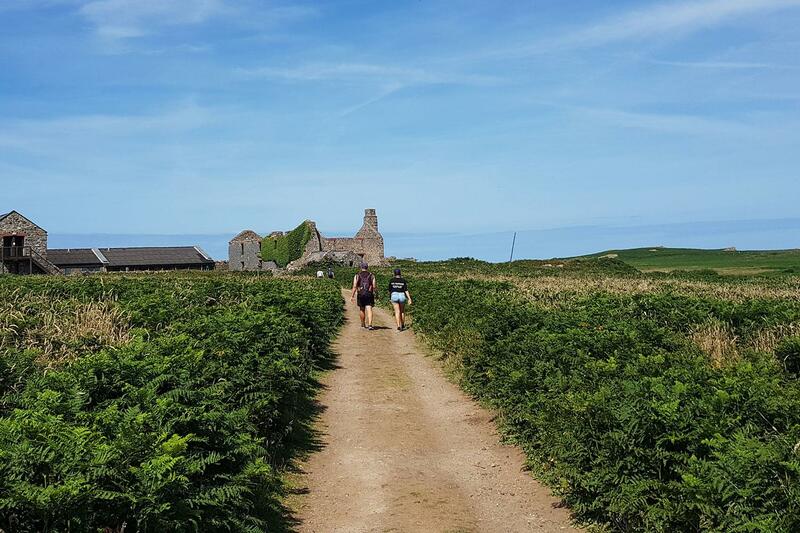 Read travel blogger Heather's experience of walking the Best of Pembrokeshire, including tips for where to go for lunch! Dale is a popular holiday village overlooking a white sandy beach, which boasts numerous water sports. The journey to Dale takes four hours from Cardiff and six from London by train and bus. 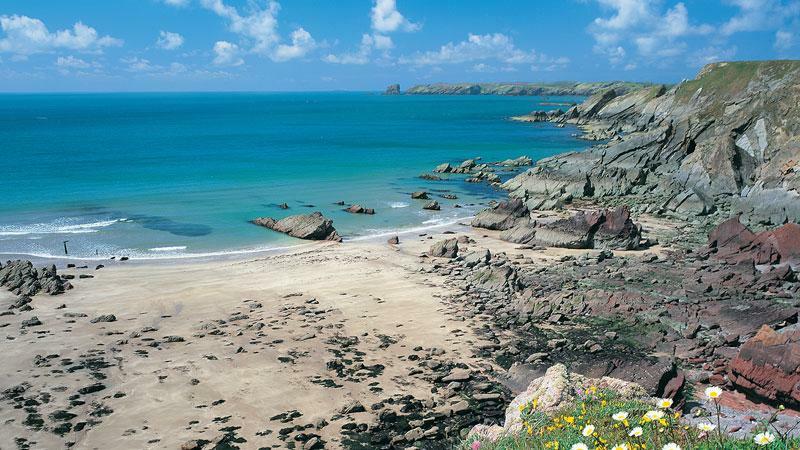 Your walk through the Pembrokeshire Coast National Park begins with a rugged section around Dale Head and then past two of Pembrokeshire’s vast golden beaches to the small village of Marloes. It is possible to shorten the walk to 8 miles by taking the shortcut across the neck of the Dale peninsula. 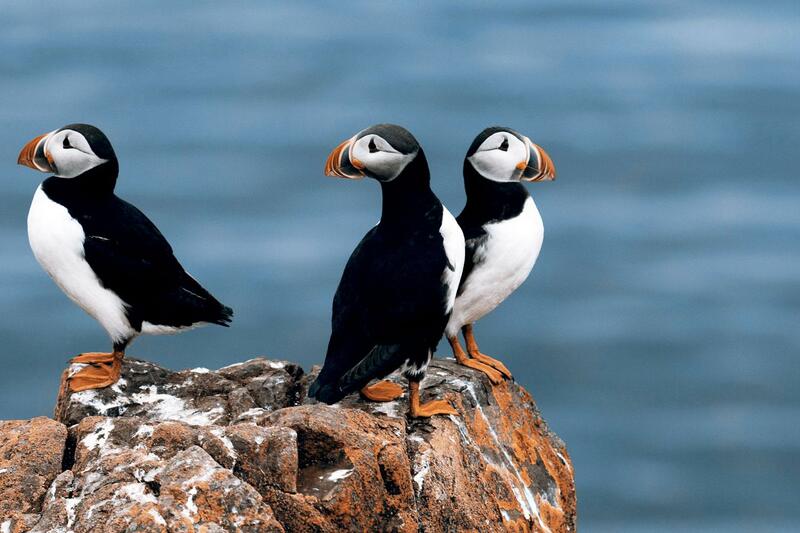 The largest of the Pembrokeshire Islands is home to the largest colony of seabirds in southern Britain. At its best in spring and early summer thousands of puffins, Manx shearwaters, razorbills and kittiwakes breed on the island. Look out for seals and dolphins on the short boat trip to the island where you can enjoy an excellent 4 mile walk which explores the best of the fauna, flora and history of Skomer. Following the Pembrokeshire Coast Path, which hugs the high coastal cliffs, you can look forward to panoramic sea views all day. 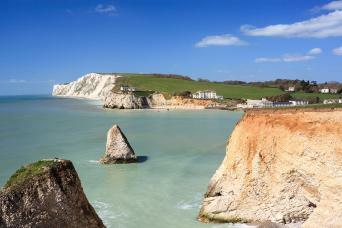 Little Haven is a delightful little row of cottages tucked into the head of a sandy beach with several welcoming pubs. Just another 30 minutes takes you over the hill to the slightly larger town of Broad Haven. The path continues north past secretive coves and wide open beaches, popular with surfers, to Newgale. Here the hard work starts with some steep ascents and descents but you can look forward to arriving in the village of Solva, probably the prettiest village in Pembrokeshire. From Solva the path continues to follow the clifftops west, passing several small coves. The cliffs are dramatic and as always the views superb. You leave the coast at St Non’s, the birthplace of St David, patron saint of Wales. 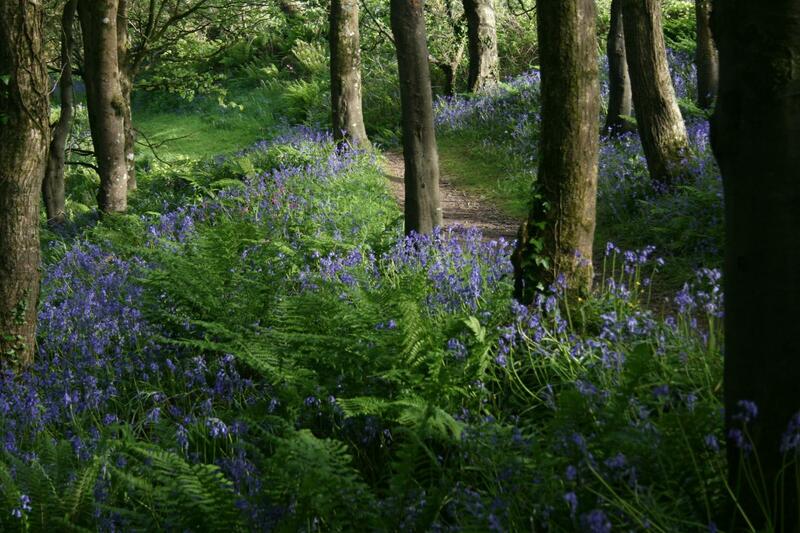 The path then heads inland to St David’s, the smallest city in Britain and home to 12th century St David’s Cathedral. 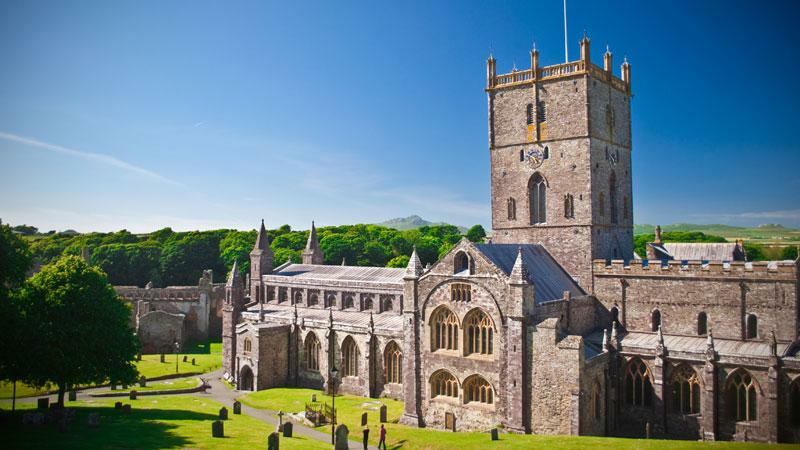 The impressive cathedral was built on the site of St David’s monastery in 1181. Destroyed and restored over the centuries it is an important pilgrimage site and together with the Bishop’s Palace can be explored at length. 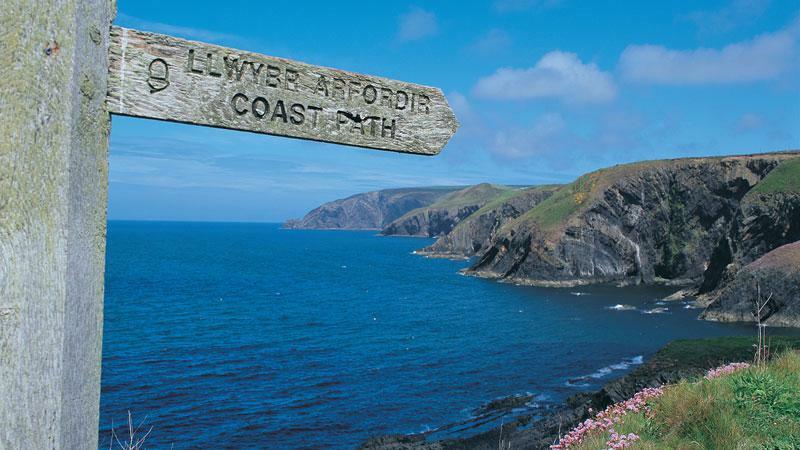 The coast path from St Non’s Bay takes in a wild and savage section of the Pembrokeshire Coast. Enjoying great views of Ramsey Sound and Island your walk finishes at the lovely Whitesands Bay. Alternatively you can visit Ramsey Island, another important wildlife reserve with a large seabird and seal colony. The route is way marked throughout with finger posts and acorn symbols. 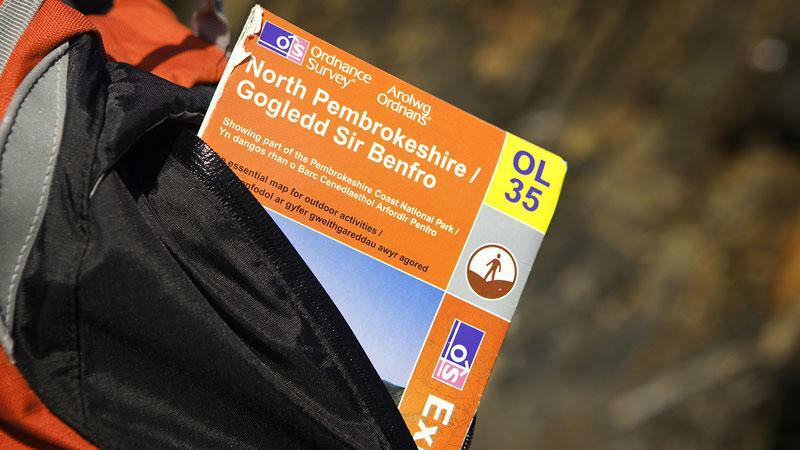 We also supply a detailed map and guidebook which describes the route. As always when walking you should be able to read a map and use a compass in case of bad weather. which are normally of 3 or 4 star standard with en-suite bathrooms. keep you going for hours. to provide a packed lunch on request and this can be booked on arrival. The Best of Pembrokeshire is available to start on any date during the season. Select your preferred start date on the calendar to book your trip. Please note however that the boats to Skomer Island do not operate on Mondays. 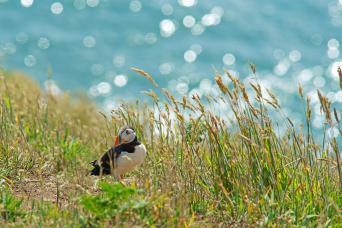 Therefore if wish to visit Skomer Island you should not start your trip on a Saturday. Due to it being Puffin Season the whole of June is now full in Marloes, please avoid booking over this period if possible. Your bags will be transferred from your accommodation as per your itinerary and moved onto your next overnight accommodation. We ask you to limit your luggage to one bag of up to 18kg per person. Please ensure that you do not bring more than one bag of 18kg, as if this occurs, the luggage transfer company will ask you to pay an additional fee (approx. £8.00 per day, per bag). This additional payment, should it be necessary, needs to be made locally to the driver and in cash. All luggage need to labelled as if they are not labelled we cannot guarantee that they will reach you at the next accommodation. If you are travelling from far afield and do have more than one bag it is possible to arrange for the extra luggage to be stored whilst you are on the tour. (There maybe a small charge for this). These additional bags would be picked up at your accommodation at the start point and dropped off wherever you finish depending on the itinerary you choose to do. Please contact us if you are interested in this option.on. There is a great wealth of information on the National Trail Website and this also has up to date diversions so it is worth a look before you set off on your walk. Another good website is the Visit Pembrokeshire Website which has detailed information and may help with deciding on which part of the trail you are looking to walk. will also have access to the Macs Adventure Smartphone App enabling you to follow the route using your phone's GPS so you will have no problems finding the way. Our itineraries and guide book are written from South to North although the itineraries can be reversed if necessary. 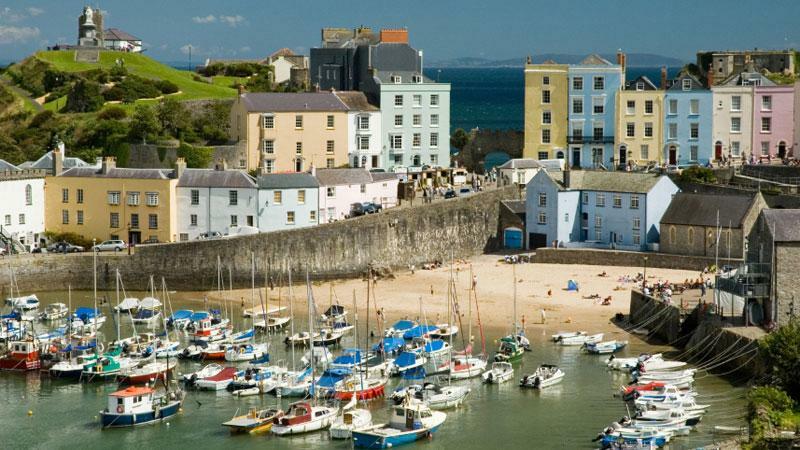 St Davids, Pembroke and Tenby are great choices for extra days. Solva is a magical village tucked into the hillside and there are plenty of circular walks over the cliffs that can demand an extra day. By Train - Regular trains run to Milford Haven from London (5h00), Cardiff (2h50), Bristol (3h50) and other UK destinations. (www.nationalrail.co.uk) for timetables and tickets). You can then take a bus (40 minutes/3 per day) or taxi (20 minutes/approx £20) to Dale. By Car - You can leave your car in Dale and return at the end of your trip by bus (1h35). By Air - Cardiff is the closest airport, Bristol is also as option as are the London airports. Getting from St David’s By Bus/Train - Catch the hourly bus to Haverfordwest (50 minutes) and train from Haverfordwest. Alternatively you can catch the bus to Fishguard and onward train. By Bus - St Davids doesn't have a train station but you can travel by bus to your onward destination. To Swansea it takes approx 3 hrs. 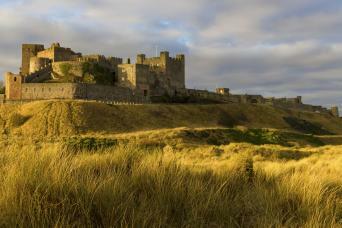 Accommodation in carefully selected B&B's, Guest Houses and Country Inn's. This walk is graded moderate and has some steep ascents and descents so you will enjoy it more if you have a good level of walking fitness. That said you can skip sections or take rest days by using the local tourist bus service.If you currently don’t enjoy an active lifestyle we suggest regular walking in hilly terrain supplemented by cardio vascular exercise prior to your walk. A good gym or personal trainer will be able to draw up a personalised training programme. We suggest you book as soon as you know your plans as Pembrokeshire is extremely popular especially over April/May and July/August. You can take the local tourist bus, which hugs the coast, public transport or local taxis to continue to your next overnight stop. Had a great time walking along the coast path in Pembrokeshire. The walk is lovely. Beautyfull and dramatic scenery. I walked the path in september and some days were very stormy. I had to cut one day short, as the wind was to strong, but Macs tripnotes, map and app made it easy to figure out where to stop and find a bus. Loved the different bnb's I stayed at. A couple of longish days (20 km), but plenty of opportunities for scenic breaks on beaches. In September the ripe blackberries along the trail were a nutritious supplement to snacks. Such a fantastic trip. Weather was spectacular, wildflowers were stunning, puffins were funny and friendly, hosts were thoughtful and welcoming, and the tides were perfect for end of day dips on those stunning sandy beaches....we couldn't have asked for more. Stunning Scenery, Wonderful people, Fabulous walk. After reading everything I could, and talking to MacsAdventures about footwear for this trip, I chose Gortex hiking shoes. There was lots of what I'll call inconclusive info out there about appropriate footwear for hiking a coastal path, but in retrospect I think people should be strongly encouraged to wear hiking BOOTS. I talked with lots of locals and believe that it would be a very rare occurrence if the Pembrokshire Path was not muddy over the course of a few days walking. There's just so much rain in that area all year long that the path almost never really dries out. Plan on a muddy path and you probably won't be disappointed. - We had one pair of hiking poles between the two of us. In general we're not big hiking pole users, but there were MANY times when at least one pole per person was very handy: LOTS of rocky stream crossings, big rocky downhills, steep steps, etc. - You'll be walking through lots of gorse, raspberry bushes, and other prickery things overhanging the path. Shorts or skirts are NOT a good idea - your legs will be badly scratched if you don't wear long pants. Luggage transfer is a wonderful thing! Long distance planning is made easy when working with the folks at Macs. The trip to Skomer Island is a must. Take a warm hat. The puffins were superb .. The best time of year to see them. One aspect that didn't delight us was having to walk inland to Marloes .. Especially after the trip to Skomer. The Pembrokeshire trail is amazing. Way-finding was easy and the hiking was perfect. Some long days p, but the trail is mostly fairly level, with great opportunities for rest stops on beaches or cliff tops. 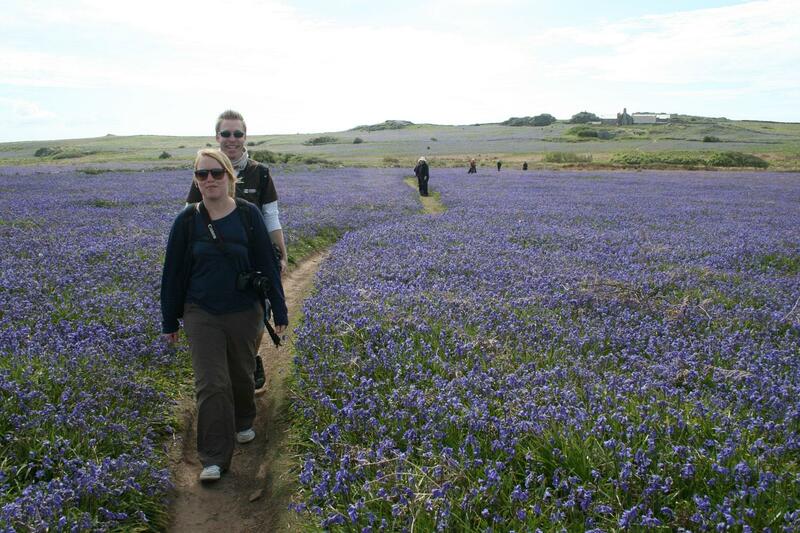 The flowers in May were gorgeous, and don't miss a trip to Skomer Island. The Welsh coast really must be experienced and walking it was a simply wonderful way to do it. Highly recommended!! This trip is perfect for you if you want to discover the best walking in Wales, quaint fishing villages, prolific wildlife and buckets of history in a fabulous week.